As we are narrowing down our costume choices for this year, I thought it would be fun to take a trip down memory lane at our past Halloween costumes. Through the years the kids have come to expect me to make their costumes and believe I can make just about any character. While that may not be true and some of the costumes may be simple, I love making these and seeing their faces as they put them on. (Pooh: While shopping in Babies R Us one morning with the boys, Alex decided he wanted to try on the Winnie the Pooh costume. I put the one piece on him, zipped him up, and let him look in the mirror. When I went to get him out of the costume, the zipper stuck. I mean, would. not. budge! I tried and tried to get him out of the costume. I ended up getting scissors from a clerk and cutting him out. I now had to buy the costume and was now the proud of two pieces of a costume with a broken zipper. When I took the costume into Hancock Fabrics to ask if there was anyone I could pay to fix the costume, an employee took pity on me and fixed the costume for free. 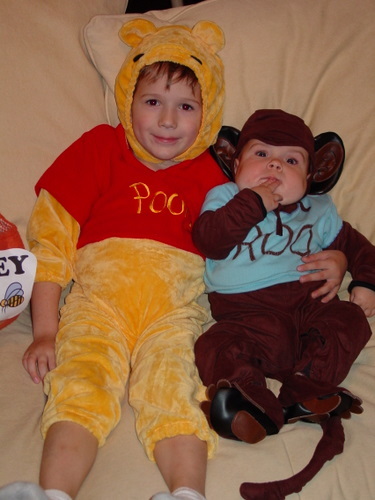 So that’s how Alex ended up being Winnie the Pooh for Halloween). (Roo: Since we already had a Pooh I decided we needed a Roo. 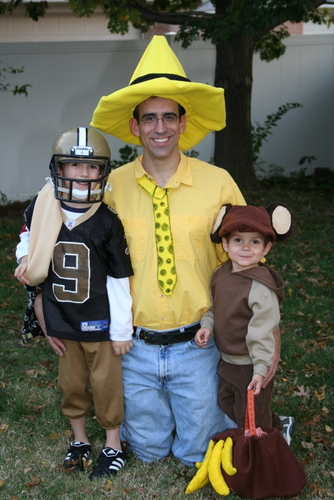 Andrew’s costume is actually a monkey costume with a blue shirt I wrote on over the costume). 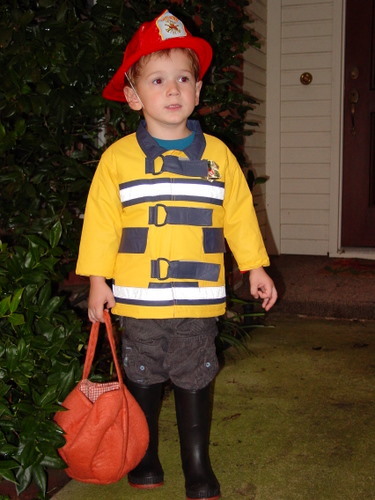 What are some of your favorite Halloween costumes you remember? This entry was posted in Alex, Andrew, bargains, budget, caroline, clothes, dress up, family, holiday, husbands, parenting. Bookmark the permalink. Ha ha! They were all so darn cute. I’m going to post some pictures of last years coustumes too. Thanks for the idea. Those were some awesome costumes! You are so creative! Coming up with fun Halloween costumes is not in my DNA (hahaha) so I am the Mother who caves into buying them every year. Sad, I know. It was so cute watching your boys grow in your pictures! You have a beautiful family! Stopping by from Sew Can Do link party. So cute! And you are so creative. I loved the story about the Winnie the Pooh costume! 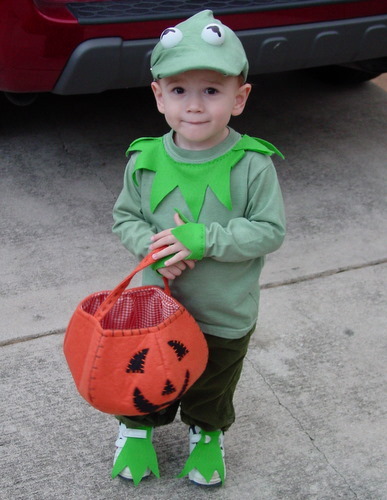 I miss little kermit! I can’t believe how fast they have all grown up! thanks for the memories! Such cute costume ideas! 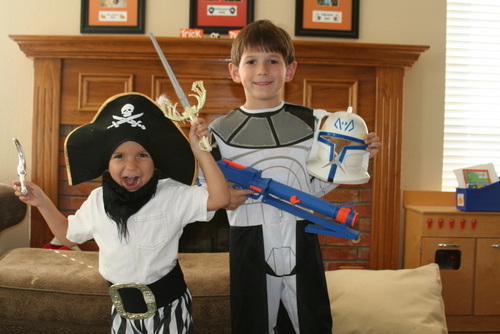 I LOVE homemade costumes – so much better! It would be awesome if you would stop by and add this to our Great Halloween Link Up going on over at our blog. This post was part of the reason why I could Not Wait to share my own. Such cutie pies. All the costumes look great! I love seeing your family grow from year to year! So much fun to look back at these photos! 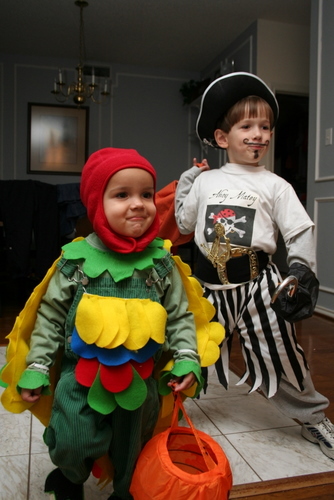 I think the Pooh & Roo and Pirate & Parrot costumes are my favorite! I’m working on narrowing down our costume ideas this year as well! So much fun! What a fun photo collection, thanks for sharing with us! 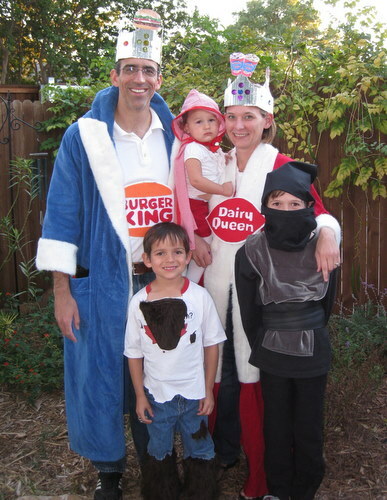 So neat to see your family grow…and the great costumes! You’ve definitely inspired me for this year! 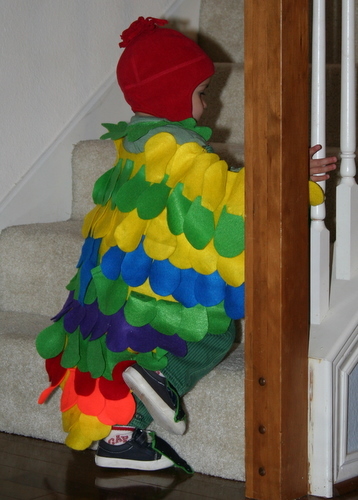 oh my goodness…i seriously almost fell over when i saw the pirate and parrot…lulu and bubba are definitely doing that one next year!! they are going to be dorothy and the lion this year…and i’m trying to convince the man to go as tin man…so far, no dice! Love it. Love your Night at the Museum. I love when families have the same theme. Hi Jennifer! What an adorable post!!! Isn’t it fun when YOU get to pick the costumes and everyone matches?!? Night at the Museum is so clever! Loved seeing them all! Thanks so much for stopping by and linking up to the Tuesday To To Party! Very creative through the years. It was fun seeing your family grow up and added to. My favorite custom, which I did for work, I wore a box of Life cereal around my neck with a knife stuck in it. Cereal killer! I know, sick, just sick. But fun! Love that you chronicled these! And I also love the most were home-made or a combo of homemade and store bought pieces. You should make an album for each child with these, so they can enjoy them when they are adults. 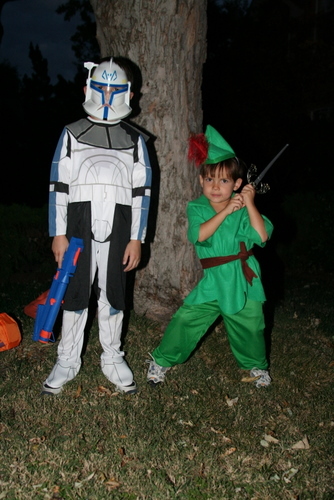 I loved seeing your costumes. You really do a great job! It’s neat to see how your family has grown too. I’m the link behind you at Happy Hour Projects Freestyle. What a nice post! Love this! Thanks for linking up to Things I’ve Done Thursday! I love these ideas! I love seeing your family grow over the years, too (and for Mom to get in the pictures, too!). 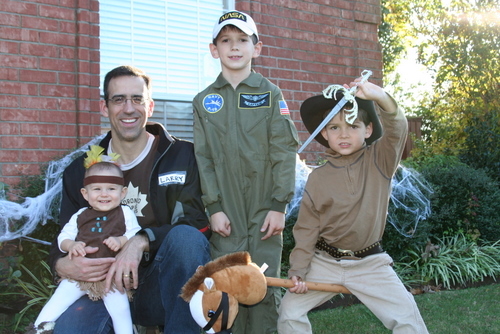 I have a big list of family costume ideas on my blog (with pictures of our costumes over the years), but I always end up making them—so far my kids are too young to ask for store bought costumes, but this year they don’t seem interested in doing a family costume (unless we can do Phineas and Ferb again). My older sister was a nurse and I was a patient one year. 🙂 I have no idea what my own kids are going as this year. I’m sure the 8 yr old will want to be a ninja/karate guy of some kind. The 1 yr old…um…I am totally unprepared! The colorful, delightful and friendly parrot caught my eye! 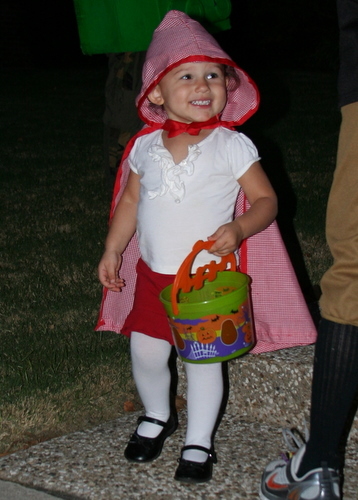 What a “hoot” Halloween brings out the KID in our family as well and I am working on a post about our FAVORITES as well! Your family is adorable! Wow…you are super crafty! I was thinking of taking my girls and making them element symbols from the periodic table, but yours are way cooler than that! thanks so much for linking this up to tip-toe thru tuesday! i loved looking through all of these cute halloween costume ideas!! just wanted to let you know that this will be featured this week. 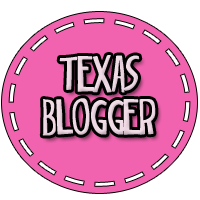 so stop by and grab your featured button! these are such fun costumes! And how neat to look at them all over the years! Great post! Thanks so much for linking up to Tuesday Talent Show! I would love to have you stop by and link up again tomorrow with more great projects! PS, I loved this so much I showed it off, thanks for 8 years of inspiration!